In this first of a two-part series, follow along as K&J Magnetics builds a Mendocino Motor using neodymium magnets. What is a Mendocino Motor? 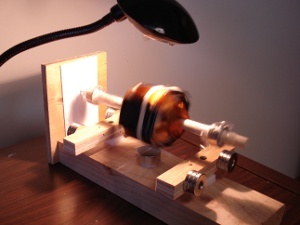 The Mendocino Motor is a magnetically levitated, solar powered electric motor. It was first made by inventor Larry Spring of Mendocino, California, for which it is named. What is it for? Why build it? First, let’s acknowledge that this motor isn’t very powerful. It isn’t useful for getting much work done. You’re not going to power a car with it. It is an interesting science project and a cool conversation piece. We like it because it is a great demonstration of the principles involved in most electric motors. If you can understand how this one works, you’re on your way to understanding all sorts of electric motors. Mendocino motors are usually constructed from simple, easily understood, readily available materials. Because there are a number of interesting topics to cover, we’re separating this how-to into two articles. In the first part, we focus on how to setup the pseudo-levitating shaft. In the second article, we will add solar panels and coils of wire to set it in motion. Repelling magnets are not stable. 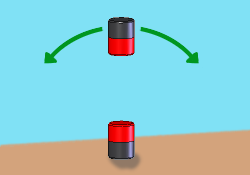 If you put the same poles of two magnets facing each other (north facing north or south facing south), you will feel a repelling force between the magnets. If you try floating one magnet over another magnet, it is not stable in that position. The upper magnet won’t just float in place. Magnetic forces act to rotate and flip the magnet around to attract and stick together. But what if we use 2 magnets underneath the floating magnets? Won’t that make it stable? It stabilizes it in some directions, but not all. In the series of diagrams shown below, two magnets are spaced at some distance apart from each other with the north pole facing “out of the page.” You’re looking at the north poles of the magnets. It doesn’t stop the floating magnet from simply rotating around. It also doesn’t prevent it from moving in and out of the page. In an unconstrained setup like this, the floating magnet will tend to shoot forward or backward. But what if I use more magnets underneath to block it? Sorry, it won’t work. This is true for any number of magnets you place beneath it. A mathematician named Samuel Earnshaw proved that this instability is true for any number or combination of permanent magnets; see Earnshaw’s Theorem. You need some other stabilizing force to make a magnet float in a stable way. Pseudo-levitation constrains the movement of the magnets using some form of a tether or wall. This works because the theorem shows only that there is some direction in which there will be an instability. Limiting movement in that direction allows for levitation with fewer than the full 3 dimensions available for movement. Is this a truly frictionless bearing? No. There’s still friction where the point touches the wall. It’s a small amount of friction, especially because there isn’t much force pushing the point against the wall. Still, there is some friction there. We’ve seen some great Mendocino Motors where friction is minimized, but it is never gone entirely. Also keep in mind that there are other sources of friction. 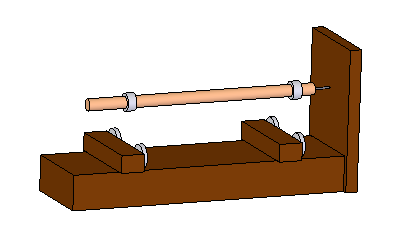 The resistance of air acts to slow down the spinning shaft. When we add the motor parts, the motion of copper wires in a magnetic field creates Eddy Currents that act as a brake, slowing down the motion. What is required to build a levitating, rotating motor shaft like this? What magnets should be used? What distances work well? The answers depend on a number of interrelated factors – there’s no one-size-fits-all answer. To demonstrate one solution, we built a simple wooden shaft with no load on it. Though it isn’t the most perfectly straight or balanced motor shaft, we used a ½” diameter wood rod. Wood rods like this are commonly available at hardware or home improvement stores. For this light load, we placed RC86 ring magnets on the shaft in two locations, near either end. For this demo, the north poles of both magnets are facing the wall. For help identifying the north pole, see Which Pole is North. We used a single D68PC-RB magnet to help in the video below. For this demonstration, we chose four RX033CS-N countersunk ring magnets in the base. These magnets are countersunk on the north pole side, which helps to identify which pole is north. After this distance is chosen, the video also shows how the base magnets are set a little further away from the wall than the floating magnet on the shaft. This provides stability, since the shaft tends to tip into the wall. We install the second set of RX033CS-N magnets in the video below. The spacing between the magnets is about the same as the first set. Since the first set of magnets are offset, holding the shaft to the wall, the second set doesn’t need to be. They can be directly under the second floating magnet. Just be sure not to offset it the other way, pulling the shaft away from the wall. One thing we have ignored is balancing the shaft. To get it to spin for a long time, it will be necessary to balance it. Our rough construction isn’t balanced very well, so you can see it wobble. Note: We’ve started work on building the motor portion of this project, which will be featured in next month's article. In our excitement for more power, we’re using a lot of wire. With the heavy motor on there, it looks like we’ll be using bigger magnets to hold it up.